The BMW i8's small battery pack earns a much lower federal income-tax credit than that given to all Tesla Model S cars—though for a $140,000-and-up car, that may not matter one whit to buyers. The 2017 BMW i8 is a stunning coupe with gull-wing doors that hides a slew of advanced technology, though the design may render its energy-efficient plug-in hybrid powertrain all but irrelevant. The 2017 BMW i8 two-seat coupe will draw crowds of gawkers for its exterior styling, which may obscure the importance of its plug-in hybrid powertrain and advanced structure. The onlookers taking selfies with its striking "bird wing" doors as they pivot up and away beyond the roof line ought to be equally admiring of BMW's technical wizardry. offered in three trim levels known as Mega World, Giga World, and Tera World, the i8 is a unique package of advanced technology and stunning design. For 2017, the only change is the addition of a vivid Protonic Red edition, the first "hot" color added to the palette of white, grey, black, and other muted tones. This even-more-noticeable version of the i8 has accents in "Frozen Gray," specially polished silver wheels, and various trim embellishments that include red upholstery highlights, grey seat belts, and a few special-edition labels. For once, the "electrifying eye candy" phrase in the i8's marketing isn't much of a stretch. From the front, the BMW i8's design has traditional twin-kidney grilles. But elements unique to the BMW "i" sub-brand provide most of its flair, including startling wing-esque fins at the rear, a distinct groove splitting the upper and lower rear bodywork, and bright blue trim accents in some colors. The 20-inch wheels and tires are a bit larger than most competitors, but give the i8 a taut look. Inside, ultra-modern lines blend with more recognizable components and switches from other BMWs. Unusual materials include stylish reclaimed wood veneer and fabrics with recycled fiber content. Both front occupants sit low to the ground, with a floating instrument pod ahead of the driver; the two nominal rear seats are useless for anything but a backpack or two. We found the i8's highly contoured lightweight seats comfortable for most occupants, though the tall tunnel for the battery pack creates a large divider between them. Design aside, it's the running gear and body construction that make the i8 unique. When's the last time such a stunning coupe came with a 3-cylinder engine? Or a charging cord to plug it into the wall? 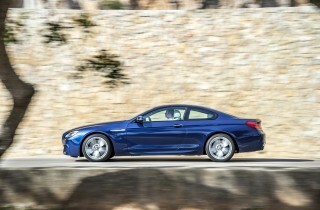 The stated mission is to respond to the world's need for "a new era of sustainable performance," BMW says. The most high-tech features may be the car's construction, in fact. The body shell is built of carbon-fiber reinforced plastic, and is attached to an aluminum rolling chassis that absorbs crash energy and carries the powertrain. That powertrain comprises two separate pieces, one per axle. Up front, an electric motor powers the wheels, fed by a liquid-cooled lithium-ion battery pack with a usable energy capacity of about 5 kilowatt-hours. At the rear, a high-output turbocharged three-cylinder drives the rear wheels, making the i8 almost a mid-engine vehicle. It can run solely on electricity, as a sporty hybrid, or with both operating together for maximum performance. It's known as a "through-the-road" hybrid, with each mode of propulsion coordinated via control software but not mechanically connected, even when they are used together for maximum performance or to provide all-wheel drive. BMW's 1.5-liter 3-cylinder engine is showing up in a variety of vehicles, mostly Minis, but the i8 had it first, and it still has the most powerful version. It's rated at 228 horsepower and 236 pound-feet of torque, and it drives the rear wheels through a 6-speed automatic transmission. The front electric motor is rated at 96 kilowatts (131 hp) and 184 lb-ft of torque; it can power the car alone at speeds up to 75 mph. The i8's all-electric range is among the lowest for plug-in hybrids, but while the EPA rates it at 15 miles, BMW says its Max E-Mode setting (which dials down the fun quotient) may provide up to 22 miles. On the other end of the scale, it provides a sort of boost that adds to engine torque in the high-performance Sport mode. Driving settings and modes abound, in fact: as well as three driving modesâ€”Max E-Mode, Comfort, and Sportâ€”an EcoPro function can be overlaid on the first two, raising energy efficiency and range by capping acceleration and other energy uses. The i8's default Comfort mode utilizes each powertrain individually or together in a more efficient manner, operating like a hybrid once the battery becomes depleted. When it runs as a gas-fueled hybrid, the i8 is rated at 28 mpg, which is good for a high-performance sporty coupe. The EPA says that the i8 scores 76 MPGe, the distance a vehicle can travel using the amount of energy in a single gallon of gasoline, when it's driven on purely electric power. In day-to-day use, the i8 motors along quietly at urban speeds in all-electric mode. Head to the highway and, in Normal, it is an efficient hybrid. Select Sport mode and things get quicker and also louder as the i8 transforms into a proper sporting car capable of storming over hill s and around curves in a "supercar-light" fashion. It's best considered a touring car, though, and not a proper track car. For 2017, the BMW i8 starts at over $140,000, including a mandatory $995 delivery and handling fee. 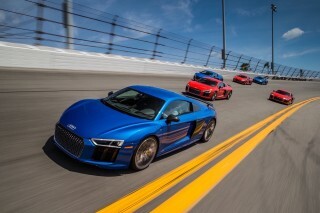 That puts it into a rarefied sector of costly two-seat performance cars. Last year,BMW received full federal approval for its laser headlights, which are an extra-cost option over the standard LED units. They're stunningly effective and provide a nearly daylight-level illumination of the road ahead. Do more than a small handful of buyers looking to drop six figures on a sporty car even care about fuel efficiency and sustainability? We think the BMW i8 would sell just as well if it were powered by coal. But its advanced technology, innovative materials, and light weight make it a high-tech icon. We suspect the company will sell every one of them it can make. The BMW i8 is simply one of the most stunning cars we know of, both stylish and original; pretty much everyone who sees it loves it. The 2017 BMW i8 is now in its fourth model year, but anyone who sees it for the first time still goes wide-eyed and assumes you're some kind of awesome celebrity. Its shape is that of a classic sport coupe, but the details make it stand out. Drive one, and you'll be swamped by selfie-taking onlookers and a barrage of questions. BMW took a low, fastback-echoing profile with short overhangs and turned it up to 11 by adding "wing doors" (known in German as flugeltur) that hinge from the windshield pillar and swing upwards. Open the doors, front hood, and rear decklid and the i8 takes on almost a raptor shapeâ€”looking as though it's about to swoop from the sky and grab a small child or two for lunch. Its details are those of the BMW "i" sub-brand styling language. The shape is sculpted to emphasize its horizontal linesâ€”despite a fairly tall tail and slab-sided panels behind the rear wheel arches. The body wraps tautly around tall 20-inch wheels, and BMW quotes a drag coefficient of 0.26, within a couple of points of the low end of the scale. groove between upper and lower bodywork becomes apparent, as the waistline of the car sweeps back across the tops of the rear fenders. A unique pair of narrow fins trail all the way from the roof rail to the back edges of the decklid, which wraps over them to form an open tunnel on each side, as the car's upper body narrows toward the rear. It's an effect found on no other car in the world, and futuristic in a way that no other brand has even attempted. It's all in the service of lowering aerodynamic drag, which consumes more energy above 30 mph than propelling the car does. The i8 is far from monochromatic. Arrestingly blue accents highlight the BMW face of twin-kidney grille openings. The parts of the i8's front, rear, and door sills that aren't body color are shiny piano black. Those accents may sound as though they are visually cacophonous, but it all works surprisingly well to create an unmistakably distinctive design. Though it's appropriately intuitive and functional, the i8's interior is far less avant-garde. The dash layout is predictable, sans the raw fiber-impregnated plastic and unvarnished open-pore wood surfaces of its i3 little brother. Despite distinctive touchesâ€”the cowl over the instrument cluster behind the wheel has an open top, for instanceâ€”the i8 is much more recognizable as a BMW from behind the wheel than is the almost Scandinavian austerity of the little i3's cabin. The blue accents even extend to a delightful (optional) set of bright-blue seat belts and the LED lighting inside the cabin. The i8's layered dashboard design and floating center screen nod to the i3, but they won't startle buyers of the more expensive conventional BMWs. Upholstery in the test car we drove was a nice mix of ivory and black leather, withÂ matte-silver accents that judiciously highlight character lines that sweep through the dash to give it visual flair. As expected for a six-figure price tag, the black soft-touch plastics on the dash and other touch surfaces offer a premium feel. The design themes of the BMW i8 come off quite differently depending on whether the exterior color is silver, charcoal, or blackâ€”since the latter two make the piano-black elements simply vanish into the general shape. All in all, the shape of the BMW i8 is coherent, distinctive, and fresh, especially its unusual but successful blue-accent treatment. It's one of the most successful designs on the market today. The BMW i8 isn't an out-and-out supercar; it's a grand touring coupe with strong performance in Sport mode and good efficiency no matter which of its personalities you choose. The 2017 BMW i8 strikes a balance between sporty performance and high energy efficiency, making it very different than similarly priced competitors like the Audi R8 and the Porsche 911. A small but powerful engine drives the rear wheels and a battery-powered electric motor propels the front wheels; either or both can be used, depending on what the driver wants the car to do. That means drivers of the i8 face a few more choices than in conventionally powered sports coupes. The i8 can be powered by electricity alone through its front wheels. Or it can run as a hybrid, using both powertrains, with the car balancing between them for maximum efficiency. Then there's the Sport mode, which gives high-performance all-wheel drive. Each of the three employs a great deal of software that continually adjusts its operations to keep all the pieces operating harmoniously and efficiently. At the rear, the wheels are powered by a 228-horsepower turbocharged 1.5-liter 3-cylinder engine, putting out 236 lb-ft of torque through a 6-speed automatic gearbox. Up front, a large 96-kilowatt (129-hp) electric motor sits between the wheels, powering them through a two-speed transmission. Its energy is supplied by a lithium-ion battery pack with around 5 kwh of usable capacity that's mounted in the tunnel between the front passengers. BMW quotes a total power rating of 357 hp when both powertrains are running at maximum output, giving a 0-to-60-mph time of just 4.2 seconds. To drive using only battery energy, the "Max e-Mode" setting keeps the i8 running electrically up to freeways speeds of 75 mph. Drivers will learn that hard acceleration past a stiff pedal detent switches on the engine, largely to provide full power in emergency situations. If that happens, the driver must re-select "Max E-Mode" to resume all-electric running. Regenerative braking is stronger in E-Mode than in hybrid mode, but drivers will quickly acclimatize to coasting down almost to a stop before braking. Once battery energy is depleted after 15 miles, "Max e-Mode" switches off and the car defaults to "Comfort" mode, which means it operates like a conventional hybrid. It starts under electric power, and then switches on the engine when more oomph is required. It can accelerate as high as 40 mph before the engine kicks in, depending on load, but Comfort mode doesn't recharge the battery to anything near its full capacity. Selecting "Sport" mode at any time gives the car maximum performance using both powertrains. The i8's electric motor switches onâ€”along with a "Boost" notice in the tachometerâ€”to give the car acceleration from 0 to 60 mph in just 4.2 seconds. Notably, Sport mode also uses engine overrun and regenerative braking to recharge the battery well above the minimal hybrid levels in Comfort mode. That allows the i8 to deliver sustained full electric power for maximum thrust. Engaged by pulling the shift lever to the left, Sport mode changes the car's personality instantly. The instrument faces take on a red glow, a tachometer replaces the power meter, and the powertrain response immediately becomes far more aggressive. 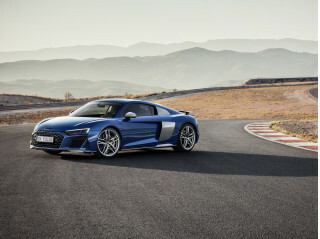 Above 75 mph in this mode, the 2-speed transmission connected to electric motor shifts into the higher of its gears to provide torque right up to the car's top speedâ€”around 135 mph, possibly higher. It's the mode that lets the i8 approach the performance its racy looks promise. 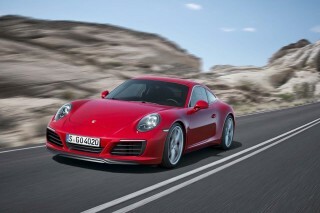 Still, it's no Audi R8 or Porsche 911, especially at higher speeds. Driven aggressively, the i8 held its own on the twisting canyon roads above Los Angelesâ€”though a skillfully driven Lamborghini, McLaren, or high-end Porsche would still quickly leave it in the dust. In Sport mode, the ride remained compliant enough that there was just a trace of bobbling if pavement irregularities appeared on hard corners. BMW has done a good job with the brutally complicated programming task of managing all the potential combinations of driving conditions, power demand, braking, sensor inputs, and the rest. It may be shuffling power being around the chassis, but the i8 provides pleasantly neutral handling. The electric power steering is precise, and there's decent (simulated) feedback through the wheel. A driver who understands the car's different personalities can effectively use them to balance off sportiness and energy efficiency. On shorter trips around town, it's a quiet, calm, smooth electric car that effortlessly keeps up with most traffic. On more varied or longer trips, it's a seamless hybrid that should deliver good fuel efficiency. When good roads with little traffic avail themselves, the i8 can become a much faster sports car. The BMW i8 isn't straight-across competition for most of the cars in its price range, which is exactly the point, since it's not trying to be. 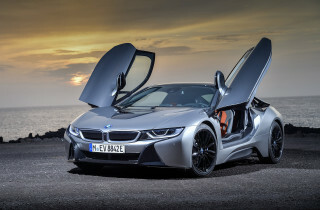 Whether its green credentials really matter in selling more i8s is open to debate. We suspect its striking looks might sell every one of the few thousand i8s BMW will build each year, even if it ran on coal. The BMW i8 is a fine two-seat coupe, though the rear seats are useless; its interior is well-built, though hardly uber-luxury. The 2017 BMW i8 sports coupe may be nominally a four-seat vehicle, but the only things you'll put in the rear are coats, backpacks, or perhaps the custom-designed Louis Vuitton bags intended specifically to fit into their limited dimensions. Live humans are not on that list. The i8's looks say "two-seater," however, so it's hardly a demerit for BMW's advanced-tech plug-in hybrid. Drivers will require a bit of training, however, to use the stunning bird-wing doors, and even to enter the front seats. The door sill is easily 6 or 8 inches higher than the bottom cushion of the front seat, and the driver must also maneuver around the steering wheel. That gives the passenger the easier task when getting in and out. Drivers or passengers wearing dresses or short skirts will require even more planning to preserve their modesty. Entering and exiting gets smoother with practice, but scuffs on the outer edges of any i8's dashboard will point out the learning process. The front occupants are separated by the tall center tunnel that contains the battery pack. And they sit very low, though we found the seats comfortable nonetheless during our few hours of test driving. We can't comment on how well they hold up over a full day's driving. The ride is firm, even jiggly on some surfaces, but remains controlled; we suspect some portion of that is due to the i8's low-rolling-resistance tires. There's little storage room inside the cabin, and for obvious reasons, the "bird-wing" doors have no bins in them. Because there's a battery underneath, the pair of bins on the big console is quite shallow. The result is that the rear seats are the only logical storage area for attache cases, backpacks, or shopping bags from high-end stores. Two small luggage compartments in the front and rear help, but soft luggage is strongly advised. When the i8 is operating in electric-only mode, a spaceship whine from the electronics was audible at higher speeds. Tire noise intruded when the engine remained off as well. With the engine on, mechanical noises from behind the bulkhead that separates i8 occupants from the rear-mounted engine are less prominent than in front-engine cars. The 3-cylinder engine has an uneven and distinctive gurgling idle that sounds rather like a motorboat engine. It rises to a pleasant howl under acceleration, but that's not the i8's natural sound: BMW has added a sound-generating chip that adds frequencies to the engine's natural note, based on engine revs and road speed, to "tune" the sound for more sportiness. One nice feature is an audible honk through the exhaust on upshifts before the engine speed lowers to match the new, higher gear. The 2017 BMW i8 hasn't been rated for safety by either the IIHS or the NHTSA, though its optional laser high-beam headlights are stunningly good. Given the high price and low sales volume of the 2017 BMW i8, it will likely never be safety-tested either by the IIHS or the NHTSA. Nor can we make any assumptions about its safety performance from the smaller BMW i3 electric car, despite both cars using similar construction, because it hasn't been tested either. The passenger cabin of both cars is contained within a body shell made of carbon-fiber-reinforced plastic that sits on a rolling aluminum chassis carrying the running gear and the front and rear crash structures. The central location of the small battery pack, in the center tunnel of the car between the two front occupants, should give maximum protection no matter what happens to the car. BMW itself says it's conducted extensive testing on the i8, both simulating thousands of crashes and using dozens of actual cars in real-world crash tests. The stylish coupe with the bird-wing doors comes with six airbags: a pair in the dash for front-seat occupants, side airbags in the backrests of the front seats, and side-curtain airbags to protect passenger heads. Its most notable safety option was finally approved last year by the federal transportation department. That would be the world's first laser high-beam headlights, which have auto-dimming that senses the light of oncoming cars. Testing these laser headlights at night showed that they offered a remarkably clear, bright, almost daylight-quality pool of light for a longer distance in front of the car than any other high beam we've experienced. They're an option to replace the standard LED headlights. Given its price, the 2017 BMW i8 offers only a few options, and its trim levels are different takes on style rather than bundles of features. The 2017 BMW i8 hasn't changed notably since it was launched in 2014. This year, the only change is the addition of a vivid Protonic Red edition, which gives the i8 its first "hot" color in a muted palette of mostly white, grey, and black. It includes accents in "Frozen Gray," polished silver wheels, and various trim embellishments that include gray seat belts, red upholstery highlights, and some special-edition labels. Remarkably effective laser high-beam headlights with auto-dimming were added as an option last year, replacing the standard LED high beams. The Mega World base trim level uses a few recycled and contrasting materials for parts of the interior, while Giga World is meant to convey "elegant sportiness," with white or black accents for a "modern" feel. The high-end Tera World includes leather and the blue accents that do so much to set the design apart from any other coupe, including bright blue seat belts that made us grin. The i8's standard 20-inch alloy wheels are 7.8 inches wide in front and 8.5 inches at the rear, with tall 215/45 and 245/40 tires. The color touchscreen is 8.8 inches, and the i8 has the usual BMW iDrive system with added functions for its unusual powertrain. The standard audio is an 11-speaker, 360-watt Harman Kardon surround-sound system. There's a full suite of infotainment options, including a navigation system, satellite radio, and of course the smartphone app for checking the status of the i8 remotely. One unusual option, from a third party no less, is a set of Louis Vuitton luggage that has been specifically designed to fit into the i8's seats and luggage compartments. The set can only be ordered only at LV stores, but buyers must present proof that they actually own a BMW i8 before being permitted to purchase the bags. The collection includes two sleek travel bags, a briefcase, and a garment bag, all of them made from the same carbon fiber threads that are used in the car's body shell. A BMW-designed 7.2-kilowatt wall-mounted charging station can be ordered for slightly more than $1,000, although the i8 can be charged using any 240-volt Level 2 charging station—even if it's far less stylish. 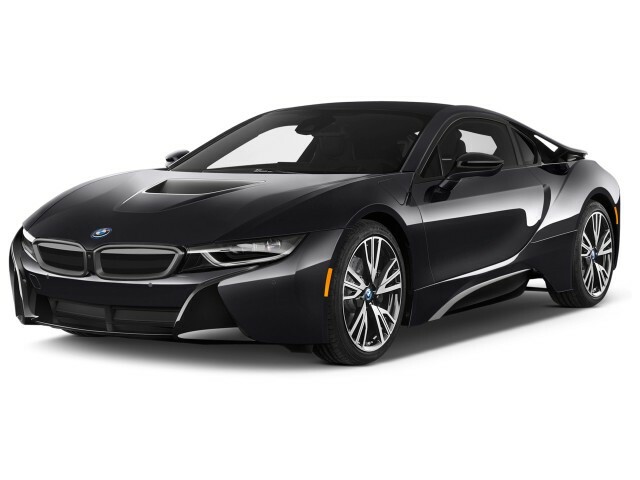 The base price of the 2017 BMW i8 is slightly over $140,000, including a mandatory delivery fee. While its electric range is on the low end for plug-in hybrids, the BMW i8's gas mileage is good for a sports car. The mechanics of the 2017 BMW i8 haven't changed from last year's version, but due to some tweaks to EPA rating calculations for 2017, its energy efficiency may come in incrementally lower. That won't change its comparative position, since all other vehicles have to be re-rated as well. The i8 sport coupe has 14 miles of continuous electric range, on the low end for plug-in hybrids. When running electrically, its rating is 76 MPGeâ€”not that high for electric cars, but a reflection of its small battery and its high-performance aspirations. On our test drive, we saw a range of 14 miles with the pack charged to more than 80 percent, so we'd expect that range figure to be about right. MPGe, by the way, stands for "Miles Per Gallon Equivalent," referring to the distance a car can travel electrically on the same amount of energy that's found in 1 gallon of gasoline. The BMW i8 is rated at 38 mpg combined when running with a depleted battery, when it operates as a hybrid in the default Normal drive mode. 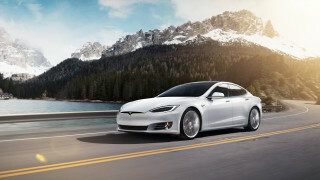 The total range of the electric and gasoline powertrains combined is 330 miles, although premium gasoline is recommended for use in its 1.5-liter 3-cylinder engine. It's the looks that make the BMW i8, and onlookers' reactions at both gas stations and charging stations range from disbelief to complete awe. There's also an EcoPro function, which increase efficiency and range by capping acceleration and other energy uses. It can be used in addition to the Max E-Mode and Comfort driving modes, though not the highest-performance Sport mode. Looking for a different year of the BMW i8?